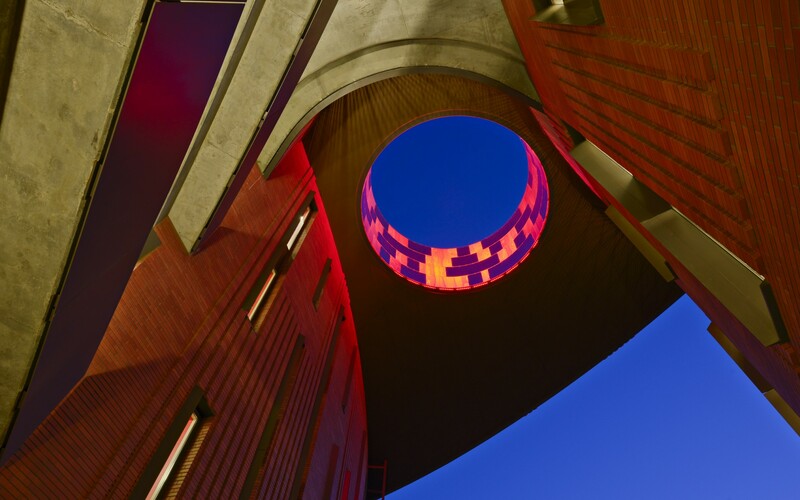 Designers Lam Partners lit the oculus at McCord Hall to create a dynamic nighttime meeting point. The oculus is composed of a staggered pattern of brushed stainless steel panels. After an extensive search, Lam Partners selected Lumenfacade Color Changing luminaires. Installed in a recessed cavity, the luminaires cross-light the structure. Fully dimmable, the luminaires can be programmed to change colors. The lighting design links the building’s two wings and accentuates its distinct layout. 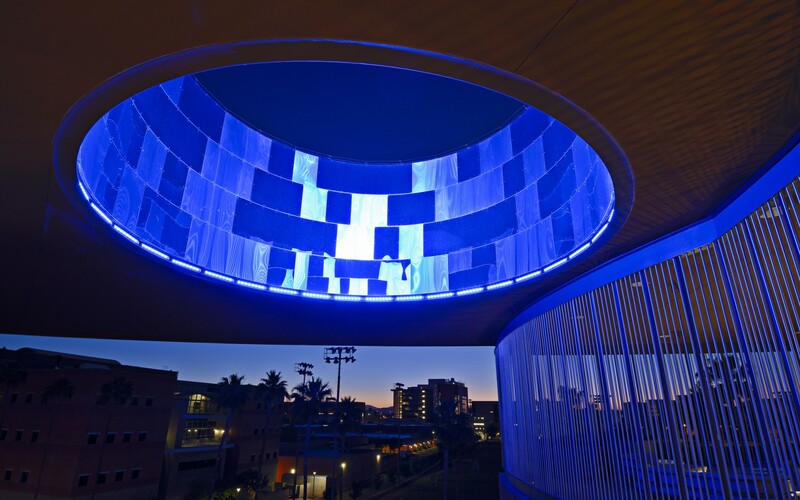 Lighting designers Lam Partners used Lumenfacade luminaires to illuminate the McCord Hall oculus, creating a visual anchor that accentuates the building's unique layout. 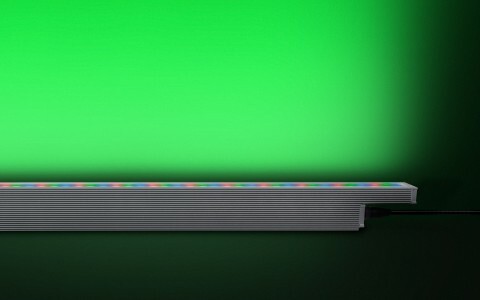 To work within the confines of the oculus, we needed powerful, compact RGB fixtures. The size and performance of the Lumenfacade made it the perfect solution. 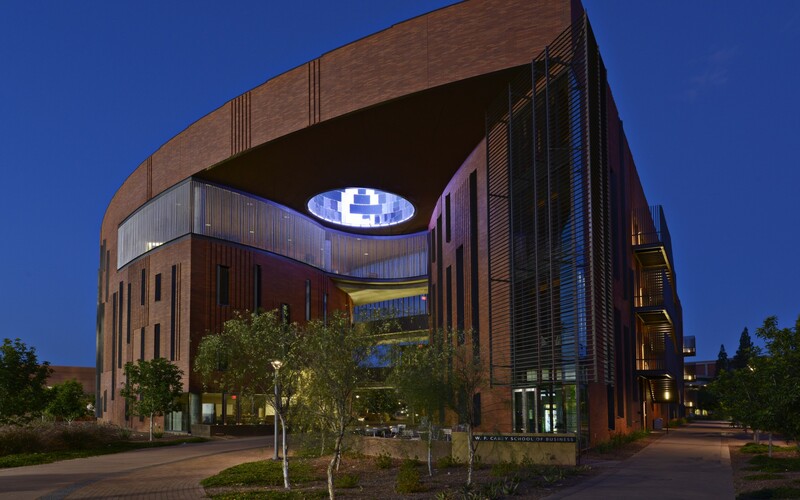 At Arizona State University's McCord Hall, architects KPF and lighting designers Lam Partners used light to give the building a dynamic nighttime feature. 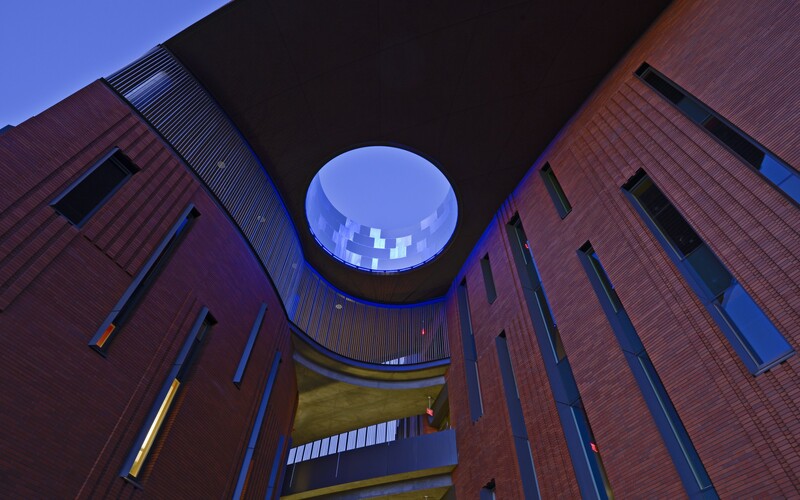 "The oculus at McCord Hall can be conceived as a "pivot" between the two wings of the school. To emphasize this, we wanted to create a visual anchor that was as interesting at night as it is during the day," said Justin T. Brown Senior Associate, Lam Partners Inc.
"This influenced the selection of the oculus cladding, which ended up being a staggered pattern of polished and brushed stainless steel panels. 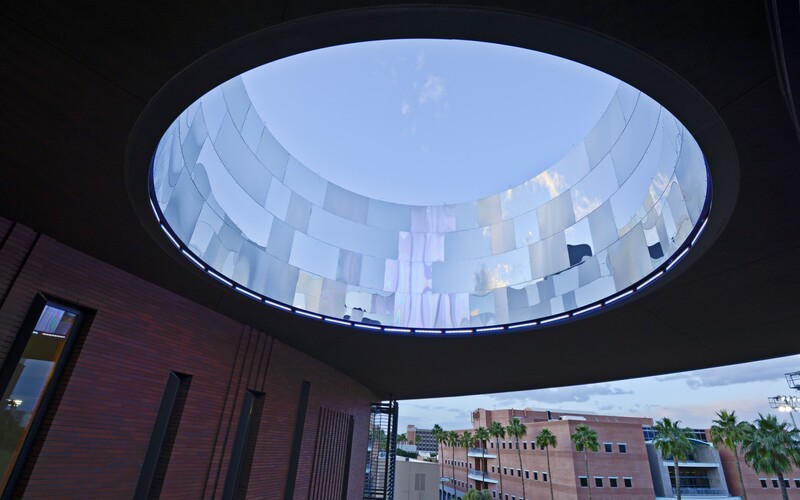 We wanted some differentiation in the inner skin of the oculus, which would catch, diffuse and reflect the light, giving some visual interest to the surface," Brown said. As the oculus is 50 feet in the air, the challenge was in devising a subtle lighting scheme that would not need regular maintenance. 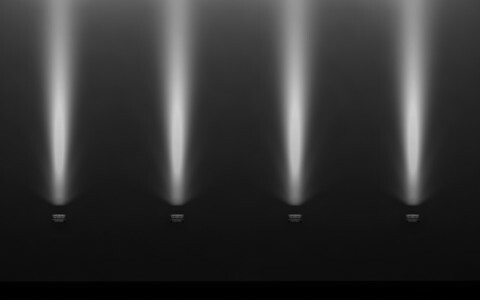 "Our goal was to make sure that it was not immediately apparent where the light was coming from. We also wanted to use one durable light source, which wouldn't need to be fiddled with often," Brown said. 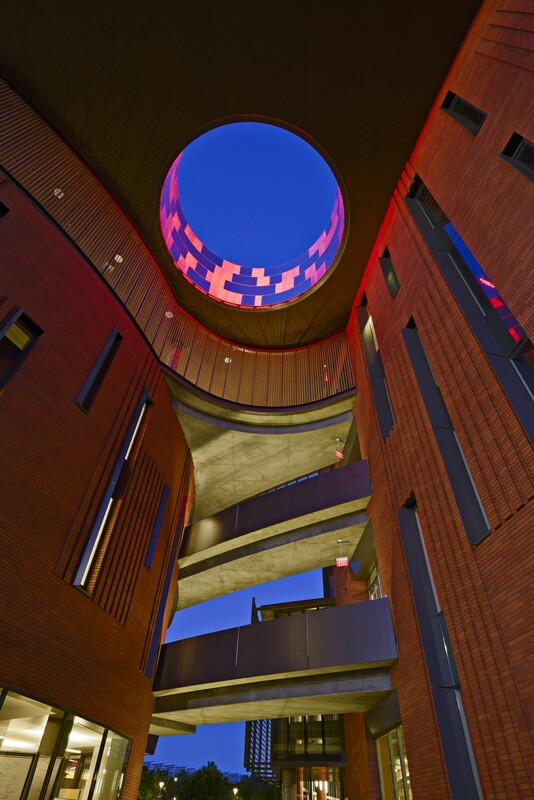 After extensive research, Lam Partners selected Lumenfacade Color Changing luminaires. Installed in a recessed cavity at the bottom of the oculus, the luminaires cross-light opposing sides of the structure using a narrow 10-degree beam. "To work within the confines of the oculus, we needed powerful, compact RGB fixtures with a specific beam spread, which could be formed into a ring. 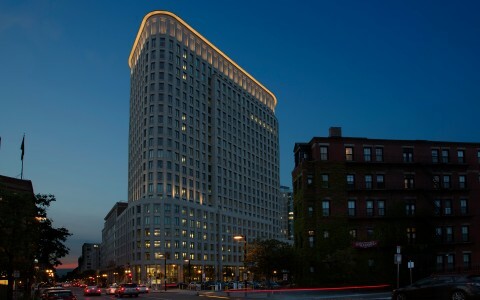 The size, performance and versatility of the Lumenfacade made it the perfect solution," Brown said. Fully dimmable, the luminaires can be programmed to change colors throughout the night, and to commemorate special events. This flexibility has helped create a new nighttime meeting point, which links the building's north and south wings and accentuates its distinct layout - all with a touch of "magic." "It's a big, beautiful anchor for that corner of the campus," Brown said. "Like this luminous UFO floating magically in the desert air."